"Secularization" is one of the most popular topics in today's religious and political discourse. But what does it mean? In the strictest sense, it means turning something sacred into something profane: for example, turning a cathedral into a "temple of reason," as happened with Notre-Dame de Paris during the French Revolution, or using a church as a cinema, as happened throughout the USSR. In a broader sense, however, secularization is the process by which functions and institutions of the Church are taken over by the State – as happened, for example, with orphanages, poor-houses, schools, and hospitals throughout Europe in the eighteenth, nineteenth and twentieth centuries. And in a still wider but vaguer sense, secularization describes the process by which the influence of religion in society decreases – as is evident in the advanced industrial and post-industrial West of our time. According to the "secularization thesis," this latter process is inevitable, and represents the victory of Science and Reason over irrational belief. Having triumphed in the most advanced countries, secularization will eventually engulf the world, as humanity marches from an age of belief to an age of reason. Recently, this thesis has been challenged. While students of politics, culture, and economic development point out that the experience of Western Europe should not be taken as a blueprint for the globe, sociologists of religion demonstrate that in much of the world, religion is on the upswing. In what is widely regarded as the world's most developed country, the United States, certain forms of religion (notably Evangelical Baptism and fundamentalism) continue to thrive and gain increased influence in political and cultural life. In Latin America and Asia, charismatic forms of religion are flourishing. Even Communist China is witnessing mass religious ferment. And in the Middle East, various forms of radical Islam attract ever more adherents. This critique of the secularization thesis has evoked various responses. Adherents of traditional Christianity point out that neither Catholicism nor mainline Protestantism are showing much vitality or influence. They have lost ground in their traditional European and American homelands, but have failed to compete successfully with the new charismatic cults in the Third World. Others, however, take a different tack. Some historians and sociologists point out that the degree of secularization has been exaggerated because the frame of comparison has been an idyllic, monolithic Christendom that never existed. 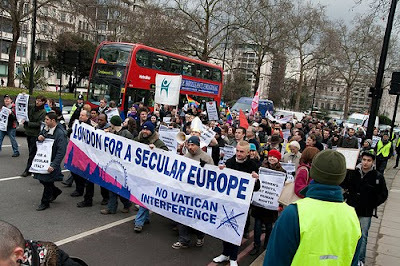 Since Europe was never fully Christianized, they argue, secularization is something of a myth. They point, for example, to medieval peasants' incomplete and inaccurate understanding of the basics of Christian teaching, to their confusion of pagan and Christian beliefs and practices, to the persistence of witchcraft, and so on. One should not, they warn, confuse the political successes of Christianity and the Church with the inculcation of Christian belief among the people. The distinguished French historian of Christianization Jean Delumeau has concluded that "the deep Christianization of the masses occurred much more slowly than the establishment of politico-religious power in past Christian eras and was ultimately never completed." In his view, as well as that of Georges Duby, the actual Christianization of Europeans occurred during the Reformation and Counter-Reformation. (Jean Delumeau, "The Journey of a Historian," The Catholic Historical Review, vol. 96, no. 3, July 2010, pp. 443, 444). Yet even if one accepts the thesis that Europe was Christianized late and incompletely, it would be difficult to ignore the obvious indicators of secularization. Even measured against conditions within living memory, the extent of sheer ignorance of Christianity, as well as neglect and outright defiance of its fundamental precepts, cannot be denied. There are, of course, all kinds of statistics, such as opinion polls and sociological questionnaires, to support such a view. We give a lot of credence to such empirical indicators: what percentage of the population believes in God? What percentage attends religious services? How often? But while statistics appear to be hard, incontrovertible facts, they can be misleading. Sometimes one can learn more from the striking detail, the telling sign. Historians frequently rely on such "anecdotal" evidence to support their conclusions – together, of course, with other objective data. According to statistics, western Ukraine is the most "religious" part of the country. The statistics of religious practice compare favorably with those of even the few remaining "Catholic countries" of central and western Europe. But more striking than these numbers are some simple, observable facts. If in L'viv you see a statue of the Virgin Mary on the corner of a dilapidated residential building, or in a niche on its worn façade, you will typically see a fresh bouquet of flowers at its feet. In much of western Europe, you may see a very similar building of the same vintage, in pristine condition, with the same statue, so typical of Latin Catholic culture. But will there be flowers? In a sense, secularization is like global warming. Few will deny that it exists. But there is great disagreement on its causes. And given this disagreement, there is further disagreement on how to address the problem, or whether it can be addressed at all. Should we reduce greenhouse gas emissions if the real cause of global warming may be sunspots, which we cannot stop? Should we try to re-evangelize Europe, when the real reason for secularization may be some blind historical force that we cannot control? What, then, is the solution? Can there be a solution? Perhaps we should start at the beginning and ask ourselves, what is Christianization? We think of it as a one-time event: the conversion of Clovis or Mieszko or Olaf, or the Baptism of Rus' through immersion in the Dnipro. Historians have taught us that it really lasted centuries, and may never have been total. But perhaps there is another way to look at it. In our time, we have seen that an apparently Christian society can become secular in a matter of generations: witness Britain. So perhaps it is the generation that is the relevant unit of measurement. And indeed, it is within a generation that Christianity can be inculcated in children – or not. Whether parents pass on the faith to their children, and the results of their decision, are all decided within twenty or twenty-five years. We have seen this process in Soviet Ukraine, where for millions of people the beliefs of Orthodox Chrsitianity were wiped out in three generations. Thus, both Christianization and secularization (or to use a better term – dechristianization) are generational processes. Obviously, these processes are not entirely the result of parental decision. The family is part of society, where a whole interplay of factors takes place on different levels. There is the civil power, and its attitude towards religion and the Church: positive, negative, or neutral. There are political factors. In Spain, for example, the Franco dictatorship may have helped maintain a façade of Catholicism concealing a weakening of religion underneath. In Poland, the same thing may have happened in the opposite way: the Communist regime provoked a Catholic solidarity among the opposition that papered over underlying ideological conflicts. There are economic, social, and cultural factors, all of which impact the family and the mechanism by which parents are able and willing, or unable or unwilling, to pass on their religion on to their children. Thus, it may be worthwhile looking at the prospects of re-Christianization of Europe on the generational level. The encouraging news is that a generation is the span of time within which we are accustomed to work.